These stunning images show the underground 18-storey city discovered by chance by a man renovating his home. In 1963, a Turkish dad knocked down a wall in his basement, revealing a secret room which led to an underground tunnel that took him to the ancient city of Derinkuyu. Photos of the preserved city document how 20,000 people – including livestock and entire food supplies – could have lived 85m beneath the earth. Thought to have been created during the Byzantine era in 780-1180AD, the network of kitchens, stables, churches, tombs, wells, communal rooms and schools was most likely used as a bunker to protect inhabitants from the Arab–Byzantine wars. During this time, cave-like chapels and Greek inscriptions were added to the ancient city , and about 600 entrances allowed people to come and go. Heavy stone doors could close Derinkuyu from the inside in order to fend off intruders, and each storey could be shut off individually. 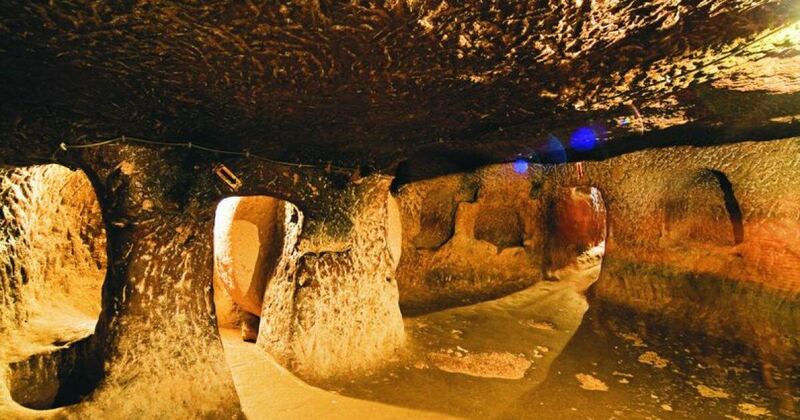 Amazingly, Derinkuyu isn’t the only one of its kind – though it’s in the running to be one of the largest underground cities. The hidden community, in the region of Cappadocia, is connected to other subterranean cities by tunnels stretching several miles. Only about half of Derinkuyu is accessible, but the site has proved to be a popular tourist attraction.